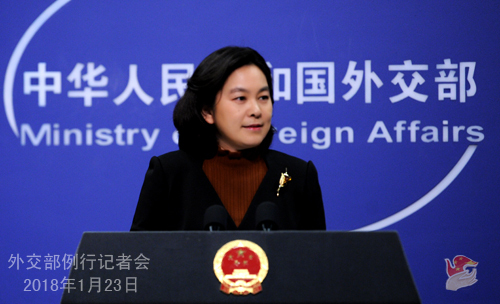 Q: The Second Ministerial Meeting of the Forum of China and the Community of Latin American and Caribbean States (CELAC) was successfully convened in Santiago, Chile on January 22. Do you have more information about the important outcomes of the meeting ? A: The Second Ministerial Meeting of the Forum of China and the Community of Latin American and Caribbean States (CELAC) was successfully convened in Santiago on January 22. President Xi Jinping sent a letter of congratulation to the meeting and Chilean President Michelle Bachelet attended the opening ceremony. Foreign Minister Wang Yi led a delegation to attend the meeting, and he was joined by foreign ministers and high-level representatives from 31 Latin American and Caribbean countries as well as heads of four regional organizations and multilateral institutions, including the United Nations Economic Commission for Latin America and the Caribbean. At the meeting, Foreign Minister Wang Yi briefed on the Belt and Road Initiative proposed by President Xi Jinping and it was warmly received by countries attending the meeting and the two sides reached political consensus on this initiative. The meeting has also published a special statement on the Belt and Road Initiative. Many Latin American countries said that the Belt and Road Initiative is a great proposal and they are eager to be part of it. The two sides agreed that the joint building of the Belt and Road Initiative will provide new ideas for, inject new impetus into and open up new prospects for the China-CELAC comprehensive cooperative partnership. The two sides are willing to optimize, upgrade, innovate and advance the China-CELAC cooperation in the process of advancing the Belt and Road Initiative, and open up a new dimension in China-CELAC cooperation featuring broader areas,stronger impetus, more optimized structure and better quality. China put forward its proposal on how to deepen the "1+3+6" cooperation framework laid out by President Xi Jinping and showed its readiness to work together to build "grand connectivity" covering both sea and land, cultivate "grand markets" that are open and reciprocal, create "grand industries" featuring advanced and independent technologies, seize great opportunities brought by innovation-driven growth and launch "grand communication" based on equality and mutual trust, which has been positively received by Latin American and Caribbean countries. 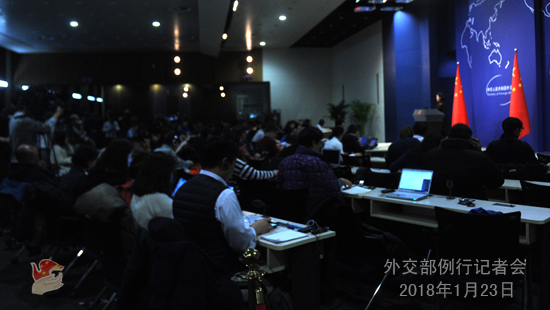 The meeting adopted the Declaration of Santiago, Joint Action Plan of Cooperation (2019-2021) (Priority Areas) and the Special Statement on the Belt and Road Initiative.They reflect an unequivocal will of the two sides to deepen cooperation and seek common development and also identify concrete measures in cooperation in key areas. We think this meeting is a full success. Just as Foreign Minister Wang Yi told the press after the meeting, it has built up the consensus on solidarity and cooperation, focused on actions for common development and identified a path to win-win cooperation. This is another handshake across the vast ocean in the new era between China and CELAC, opening up a new chapter for China-CELAC cooperation. We are looking forward to scaling the China-CELAC comprehensive cooperative partnership up to new heights. Q: Japanese Prime Minister Shinzo Abe expressed a strong will to improve China-Japan relations when addressing the House of Representatives on his policy proposals on January 22, saying that he will try to seek stable and friendly relations with China, exchange visits with Chinese leaders as soon as possible and conduct infrastructure cooperation with China. Japanese Foreign Minister Taro Kono also said Japan will take the opportunity of the 40th anniversary of the signing of the Treaty of Peace and Friendship Between Japan and China to promote people-to-people exchange and strengthen economic ties. But he also added that Japan will not accept any attempt to change the status quo in the East China Sea. What is your comment on this? China's position on improving and developing China-Japan relations is consistent. The steady and sound development of China-Japan relations serves the interests of the two peoples and is conducive to regional peace and development. We hope that Japan can, on the basis of the four political documents and four-principled consensus, move in the same direction with China to strengthen communication, build mutual trust, properly manage differences and improve and develop China-Japan relations in the right direction. With the principle of wide consultation, joint contribution and shared benefits, China stands ready to work with Japan and other parties to promote the Belt and Road and achieve common development and prosperity of countries in this region. At the same time, we have also noted Japan's position on the East China Sea issue. We hope the Japanese side will match its words with deeds and translate the positive remarks on improving China-Japan relations into concrete policies and actions. Q: The US administration yesterday slapped steep tariffs on Chinese solar panels following through on promises to take a tougher stance on trade with China. Will China take any measures in response? A: Director-General of the Trade Remedy and Investigation Bureau Wang Hejun of China's Ministry of Commerce (MOFCOM) has issued a statement concerning the question you raised. The US has launched another global safeguard investigation into imported solar products and large washing machines and the imposition of high tariffs is an abuse of trade remedy measures. China expresses strong dissatisfaction to this. We have noted that the US investigation this time has not only caused concerns among many trading partners, but also been strongly opposed by many local governments and downstream businesses at home. Regarding the wrongdoing by the US side, China will work along with other WTO members to firmly defend our legitimate rights and interests. Q: According to reports, Japanese Foreign Minister Taro Kono will visit China recently. Can you confirm that? 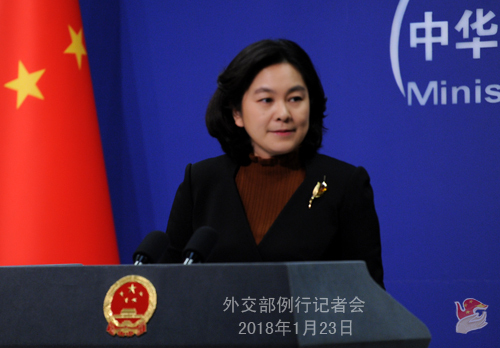 A: China adopts a positive attitude towards improving and developing China-Japan relations, which serves the common interests of our two countries and peoples and of the entire region. We believe that to maintain close communication is conducive to enhancing mutual trust and properly handling and managing differences between the two countries. We stand ready to keep close communication with the Japanese side in this regard. Q: According to reports, the DPRK Foreign Ministry released information on its website on January 21, saying that its officials discussed with Chinese Ambassador to the DPRK and representatives of international organization in the DPRK the issue of impediment to delivering the UN humanitarian relief supplies to the country. What's your comment? A: China has always comprehensively and strictly implemented the Security Council resolutions. At the same time, we maintain that the UN Security Council sanction measures against the DPRK should not affect the humanitarian assistance for the DPRK. This is also the explicit requirement of the relevant UN Security Council resolutions. In the context of Security Council sanctions and the unilateral sanctions imposed by some countries over the DPRK, there are many reasons for the problems with the DPRK's humanitarian assistance. China attaches importance to the humanitarian aid work conducted by the United Nations and other international agencies in the DPRK and has provided and will continue to provide the necessary support and assistance in this regard.